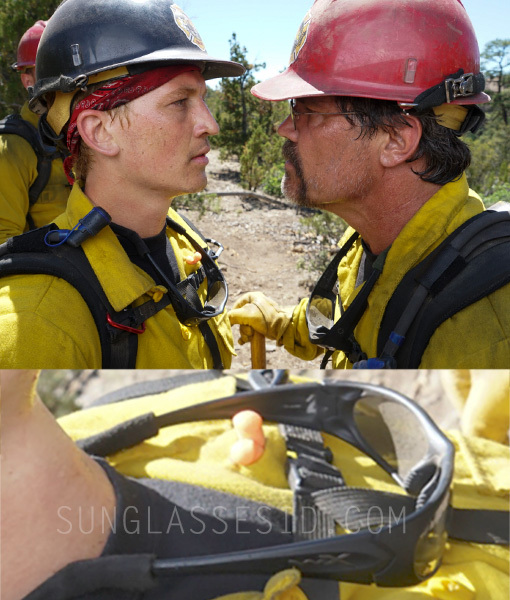 Miles Teller (left) wears Wiley X Romer 3 in Only The Brave. Miles Teller wears Wiley X Romer 3 sunglasses in the 2017 movie Only The Brave. The sunglasses have a black frame and a silver Wiley X on the temples. The Romer 3 is a full-frame, wraparound-style sunglasses, launched in 2014. The glasses are extremely strong, and Wiley X is a leading provider of protective eyewear to U.S. military, law enforcement and other tactical wearers worldwide. A pair of Wiley X sunglasses was worn by Bradley Cooper in American Sniper. Wiley X Romer 3 sunglasses are available online on Amazon, FramesDirect and SmartBuyGlasses. Miles Teller plays fire fighter Brendan "Donut" McDonough in Only The Brave (Granite Mountain), a film based on the elite crew of firefighters who battled the Yarnell Hill Fire, a wildfire in Yarnell, Arizona in June 2013 that claimed the lives of 19 members of their team. See more sunglasses from Only The Brave here.